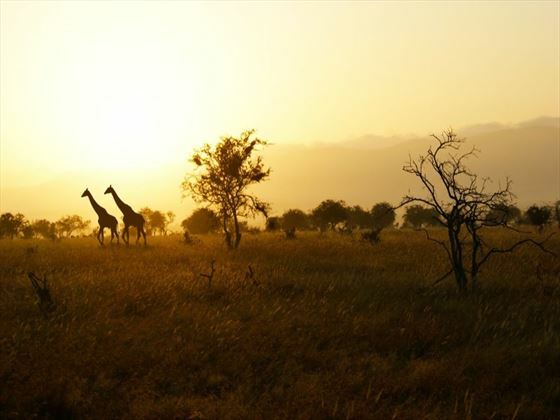 This unforgettable 11-night tour takes in many of Kenya’s most renowned national parks on a once-in-a-lifetime journey. 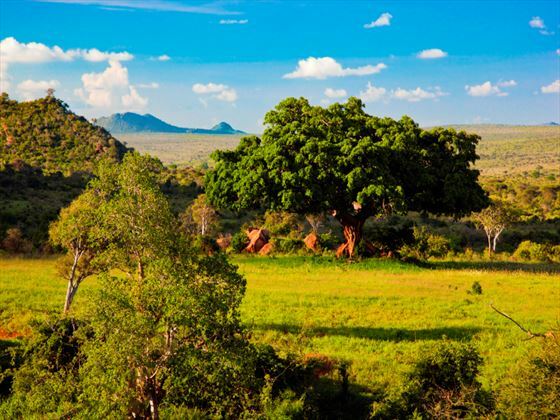 Starting your journey in Tsavo National Park in southern Kenya, you’ll gradually make your way north. Enjoying game drives in Amboseli National Park and Samburu National Reserve you’ll then visit the unique Ark Tree Lodge in Aberdare where you can watch animals drinking for a watering hole. Finally you’ll head on to the incredible Masai Mara National Reserve for amazing game drives with the chance to see incredible wildlife. 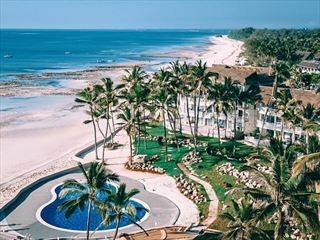 You’ll arrive in Nairobi where you’ll transfer to Tsavo National Park and onwards to Kilaguni Serena Safari Lodge where you’ll stay for two nights. You’ll have lunch at the lodge before heading out on a scenic afternoon game drive in search of Africa’s most impressive animals including lions, cheetahs, elephant, giraffes and hippos. You’ll then return to the lodge for dinner and spend the evening enjoying views over the nearby waterhole, where animals come to drink. 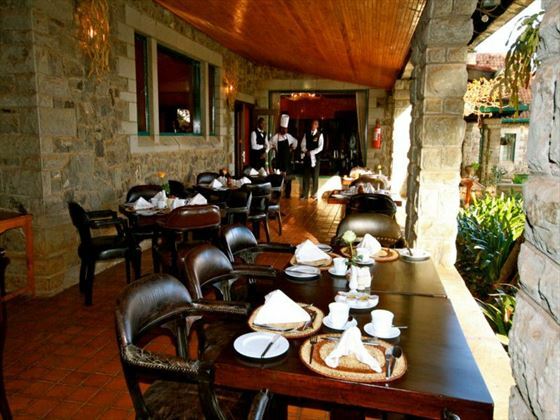 You’ll have breakfast at the lodge before you head back into the park on a morning game drive. Tsavo is home to each member of the Big Five giving you the chance to see them all over your two days here. 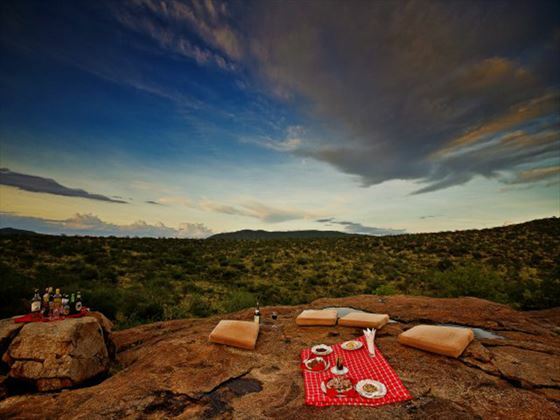 You’ll return to the camp for lunch before enjoying an afternoon game drive, and finally heading back for dinner. 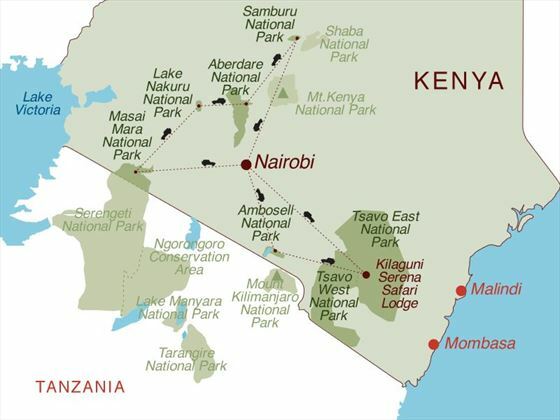 After having breakfast at the lodge you’ll transfer to Amboseli National Park – the journey takes around 90 minutes. 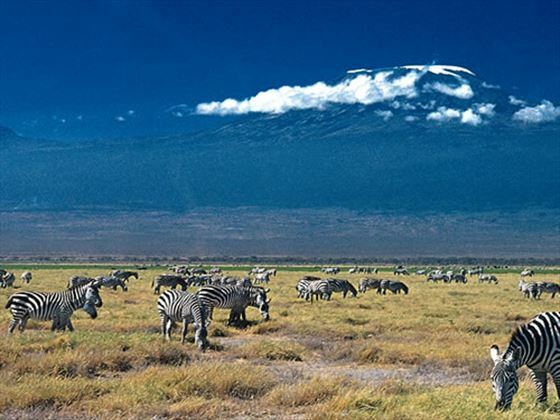 You’ll arrive at the Amboseli Serena Lodge where you’ll be treated to views of Mt Kilimanjaro. You’ll have lunch at the lodge and then enjoy a game drive through the park. Amboseli is famous for its large elephant herds. After breakfast head north towards Nairobi (a journey that takes approximately 3 hours). Arrive around lunchtime and check in to the Tribe Hotel. You can spend the rest of the day relaxing or exploring the city at your leisure. After having breakfast at the hotel you’ll check out and transfer to the Samburu National Reserve – the journey will take around six hours. On arrival you’ll check in to Samburu Sopa Lodge for lunch. After enjoying some time to relax you will head out on a spectacular afternoon game drive through the reserve. Over the course of the day you’ll enjoy three game drives in Samburu National Reserve, returning to the lodge for your meals. After having breakfast at the lodge you’ll check out and transfer to Aberdare National Park in a 4x4 safari vehicle – the journey will take around four and a half hours. When you arrive at Aberdare Country Club you’ll have lunch. The Club is your base hotel for your stay in Aberdare, but you’ll be transferred to The Ark Tree Lodge for a unique evening watching animals drinking from the nearby waterhole. You’ll have dinner and stay overnight at the lodge. Please note you can only take a small overnight bag to the Ark, the rest of your luggage will be stored at the Aberdare Country Club. In the morning you’ll transfer to the Aberdare Country Club for breakfast before collecting your luggage. You’ll then make the three to four hour journey to Lake Nakuru National Park, enjoying a game drive en-route. 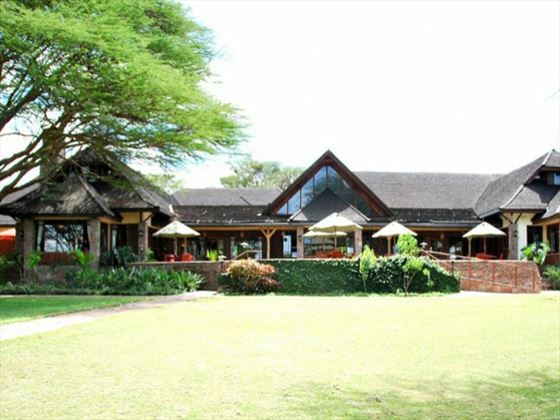 You’ll then arrive at Sarova Lion Hill Game Lodge where you’ll check in and have lunch. 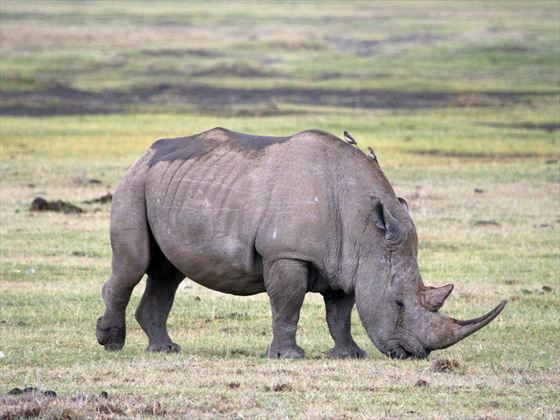 Enjoy an afternoon game drive where you’ll seek out everything from mesmerising rhinos to the flocks of pink flamingos that Nakuru is famous for. After breakfast you’ll head south west to the world famous Masai Mara National Game Reserve, a journey that will take around five hours. You’ll check in to the Keekorok Lodge where you’ll have lunch and a chance to relax. In the afternoon enjoy a game drive in the Mara, home to the Big Five (lion, leopard, rhino, elephant and buffalo). Today a full day of game viewing is included. You will head out in the early morning, mid-morning and afternoon, while returning to the lodge for your meals and overnight stay. You’ll have plenty of opportunities to seek out jaw-dropping wildlife and enjoy the impressive scenery of the Mara. 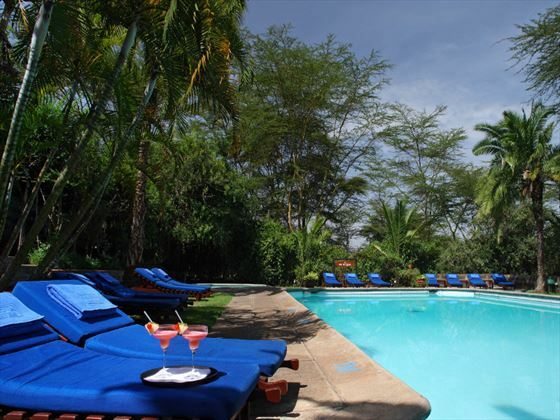 After having breakfast at the lodge you’ll check out and head back to Nairobi. 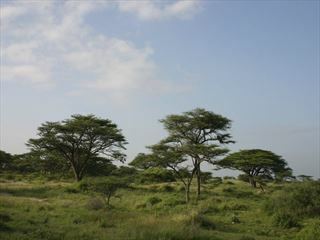 On the way out of the Masai Mara you’ll enjoy a final game drive in the park. 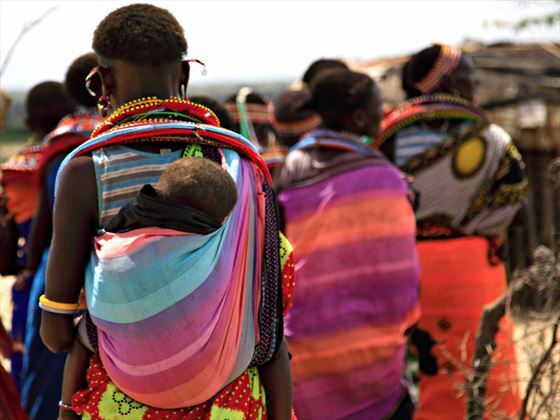 The journey back to Nairobi takes around five hours and on arrival you’ll be transferred to the airport for your onward flight. 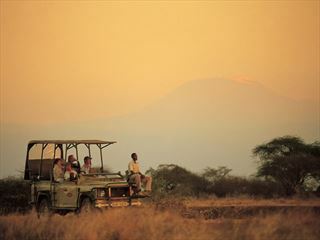 This safari departs on a Sunday from the UK (Monday locally), on a weekly basis.